Larry Crain presents the Chaloner Award to Kristin Patterson. 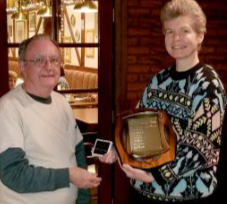 The award is the Council’s highest honor, given to people within the Council that have provided significant service to philately in the Council area sustained over time. Larry Crain and Vesma Grinfelds present the Holmsten Award to Bradley Fritts (at right). Larry Crain and Vesma Grinfelds present the Holmsten Award to Bradley Fritts (at right). The annual Holmsten Award represents exhibiting excellence in support of local stamp shows within the Council Area. The award rotates among all Council local philatelic exhibitions. 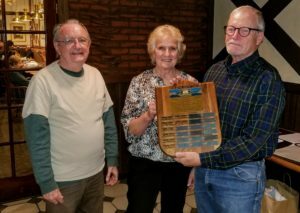 The winner of the designated local show adds their name to the perpetual trophy plaque, and their club gets to display the plaque until the next time it is awarded.